The Navy Occupation Service Medal is a military award of the United States Navy which was "Awarded to commemorate the services of Navy, Marine Corps and Coast Guard personnel in the occupation of certain territories of the enemies of the U.S. during World War II" and recognized those personnel who participated in the European and Asian occupation forces during, and following World War II. The medal was also bestowed to personnel who performed duty in West Berlin between 1945 and 1990. No more than one Navy Occupation Service Medal may be awarded to an individual. The Army of Occupation Medal is the equivalent of the Navy Occupation Service Medal. No person could receive both the Army and Navy occupation medals. The medal was designed by A. A. Weinman. It depicts Neptune riding a Hippocampus with the words "Occupation Service". The reverse has the words "United States Navy" (or "United States Marine Corps") and is the same as that of the Dominican Campaign Medal. The medal is authorized two service clasps: "Europe" and "Asia". The clasps are rectangular with a rope border. If eligible, both clasps may be worn on the medal. The Berlin Airlift Device is also authorized to those Naval personnel who have served 90 days or more with an accredited unit in support of the Berlin Airlift between 1948 and 1949. The following geographical duty areas, and time frames of eligibility, qualified a service member to receive the Navy Occupation Service Medal with "Europe" clasp. Service between May 9 and November 8, 1945 may not be considered unless the service member qualified for the European-African-Middle Eastern Campaign Medal prior to that date. The "Asia" clasp was authorized for any service performed on shore or on ships in the following geographical duty areas and time frames of eligibility. Service prior to March 2, 1946 would not be credited toward eligibility for the Navy Occupation Service Medal unless the individual is already eligible for the Asiatic-Pacific Campaign Medal for service prior to September 2, 1945. Service after June 27, 1950 which is eligible towards the criteria for the Korean Service Medal may not be considered for the Occupation Service Medal. 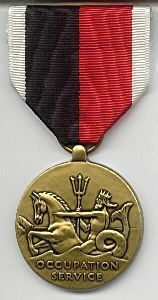 Wikimedia Commons has media related to Navy Occupation Service Medal. ^ a b c Bureau of Naval Personnel. "Requirements Listed for Navy Occupation, China Service Medals" (PDF). The Bulletin Board. All Hands. U.S. Government Printing Office (March 1948): 46–47. Retrieved 8 June 2014. ^ a b c d Kerrigan, Evans E. (1964). "Occupation 1945-1955". American War Medals and Decorations. New York: The Viking Press. pp. 101–102. OCLC 702555627. ^ a b United States Federal Register (1967). The Code of Federal Regulations of the United States of America, Title 32, Chapter VI. U.S. Government Printing Office. §733.53. Retrieved 9 June 2014. ^ a b c d "Navy and Marine Corps Awards Manual NAVPERS 15,790". Transcribed by HyperWar Foundation. 1953. pp. 161–220. Retrieved 7 June 2014. This page was last edited on 9 September 2018, at 04:31 (UTC).